On my first day in Hue, I crossed the bridge into the old city from the South Bank, walking over the Perfume River and into the mist surrounding the Citadel. 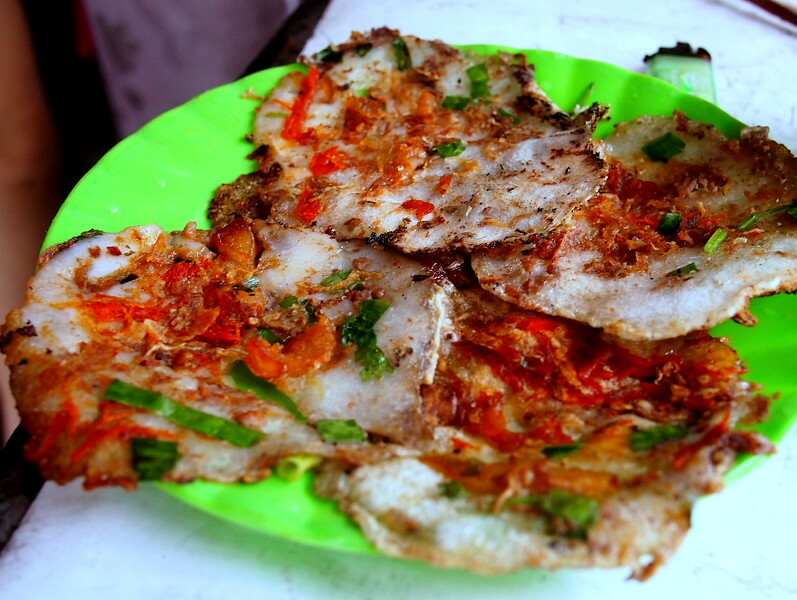 My goal was to find banh ep, a small disc made of tapioca or cassava flour flattened between two heavy iron plates and served at the side of the road. In Saigon, my mid-afternoon rewards were a hodgepodge of other fun snacks, but banh ep remained elusive. Before I made it into the gates of the old city, hunger pangs hit. In Vietnam, a soup stall is never far away. And sure enough as I set foot on the concrete of Tran Hung Dao street, I caught a glimpse of a conical hat and Vietnamese pyjamas just below me. Doubling back on my intended path, I looped under the bridge toward the Dong Ba market, scanning the sidewalk as I avoided potholes. 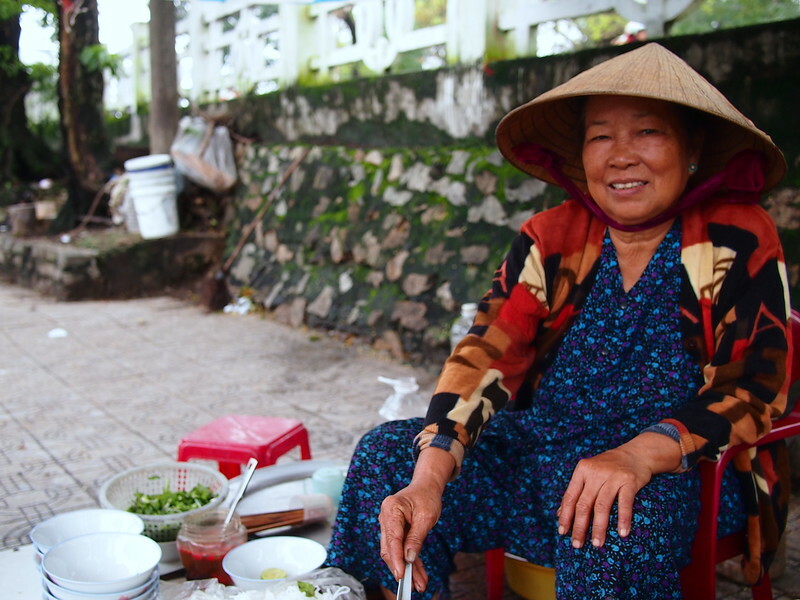 There, sitting on a low plastic chair with a beatific smile was a granny making a simplified version Bun bo Hue, the spicy beef soup the city is known for. At her side was one of the many xe om drivers in town. Anticipating that I wanted a ride, he stood up with start. I shook my head, impatient with the rumbles in my stomach. 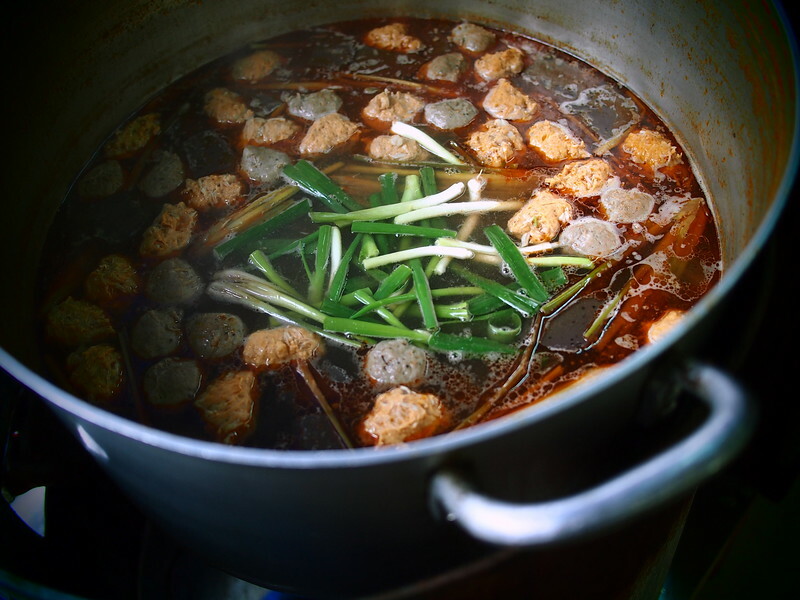 “Bun bo Hue?” I asked granny, pointing at her metal pot of broth. Her head jerked back in surprise, and then she looked at the driver and burst out laughing. As the motorcycle taxi driver gave me one last baffled look and hopped on his bike, I sat on a tiny chair, watching as he deftly spun it full circle and drove out into the haze. Waiting for granny to compose my bowl of noodles, my eyes settled on the steady stream of motorcycles traversing the bridge and fanning out, seeping almost seamlessly into the many breaks in the old city walls. I found the banh ep eventually, but not on that day. I made the mistake of walking instead of taking a motorbike or bicycle, and by the time I started zigzagging the tinier streets, looking for a tiny handwritten sign, darkness had fallen. I had missed my snack window. I returned later in my visit, skidding to a stop when I saw the telltale flatiron being set up on the side of the road. My visit to Hue was a last minute trip, one that I booked gleefully the evening before my flight. Despite having spent several seasons in Saigon, I never made it up to this former capital. I first read about Hue’s history when I arrived in Vietnam in 2012 and then pored over the details of the city’s rise as I planned my food walks. Like many of the cities in Southeast Asia, it went through a Rolodex of rulers and conquerors. The Cham kingdom came first. They were followed by the Chinese, who captured Hue several times. In the early 1300s, it was surrendered to what was then called Dai Viet (now Vietnam), and later became a central power of the Nguyen lords as their feudal dynasty ascended to prominence from the 16th century onwards. In 1802 the emperor Gia Long (born as Nguyen Phuc Anh), took over the reigns of the city and established it as a capital of Vietnam as a whole, affording him control over both the north and the south of the country. 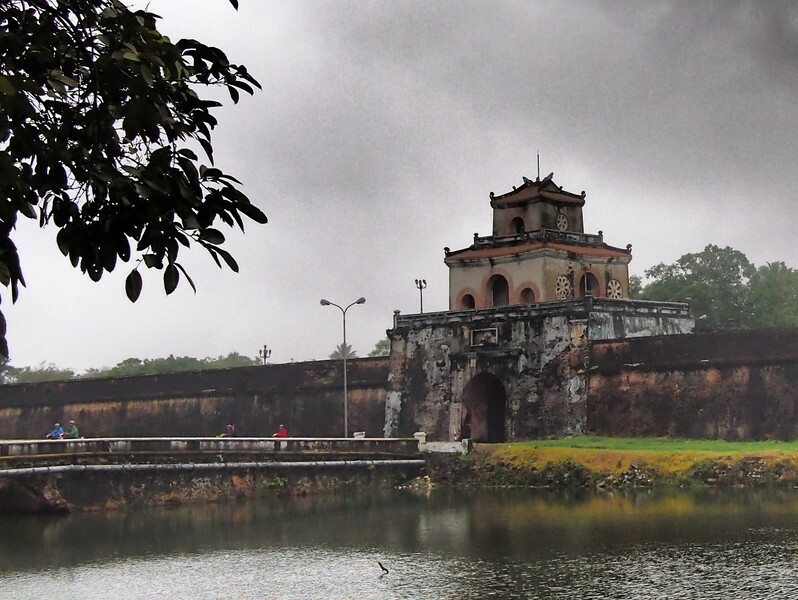 Given its location in the middle, Hue was a wiser place to rule than the more remote Saigon. 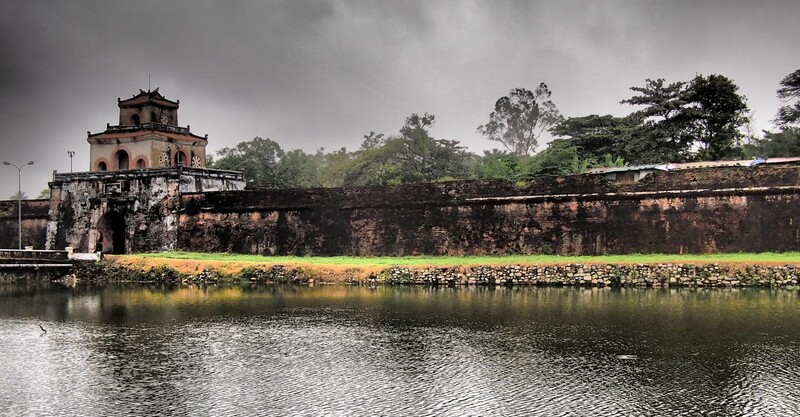 He built the imperial city’s walls, 11km long, surrounded by water. Within them, the Purple Forbidden City, modeled after Beijing’s own Forbidden City at the heart of its metropolis. 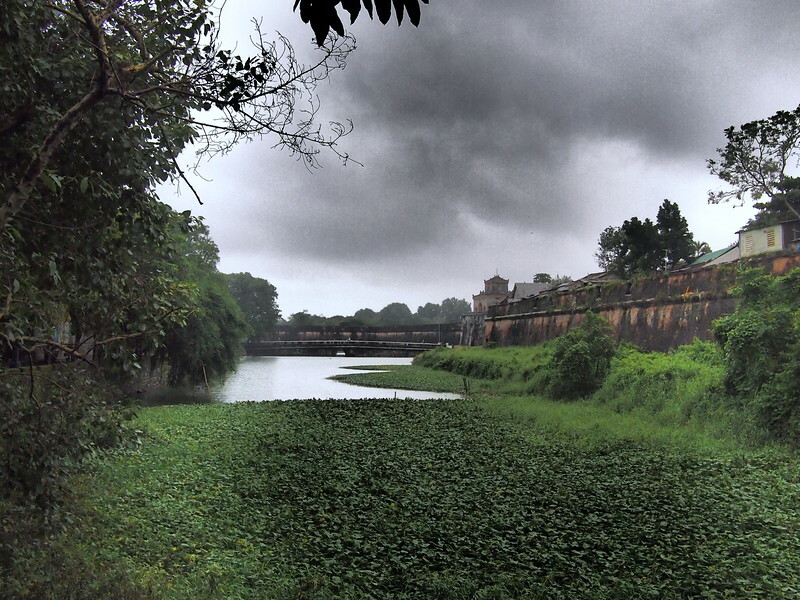 When the French subsequently controlled Hue, the South Bank across from the Imperial walls became their quarters, buildings lining the right side of the Perfume River. The city was then occupied by Japan from 1940-45, and then, in the years that followed, the capital of Southern Vietnam was moved to Saigon. As if those cycles of conquering and surrender were insufficient, the city has gone through several others since the end of WWII. During the Indochina wars, angry uprisings burst out of the city centre several years in a row. Hue was also heavily bombed during the Vietnam War (called The American War here), as it sits just below the Demilitarised Zone (DMZ). Many of the imperial buildings and shrines were damaged, and during the Tet Offensive, the battles were particularly bloody. Many, many people were lost—their bodies never identified or recovered. This—the inability to find the physical remains of a relative—is a particular agony to Vietnamese. I came to Hue for the food, of course. I spent many a night eating central Vietnamese food in Saigon — giant snails steamed with lemongrass and stuffed with pork and mushrooms, banh da xuc hen, a baby clam, lemongrass, and chilli dish served with a giant rice cracker to scoop up the delicious seafood, banh beo, tiny rice flour disks fashioned after lily pads, circular and symmetrical, topped with shrimp and pork skin. 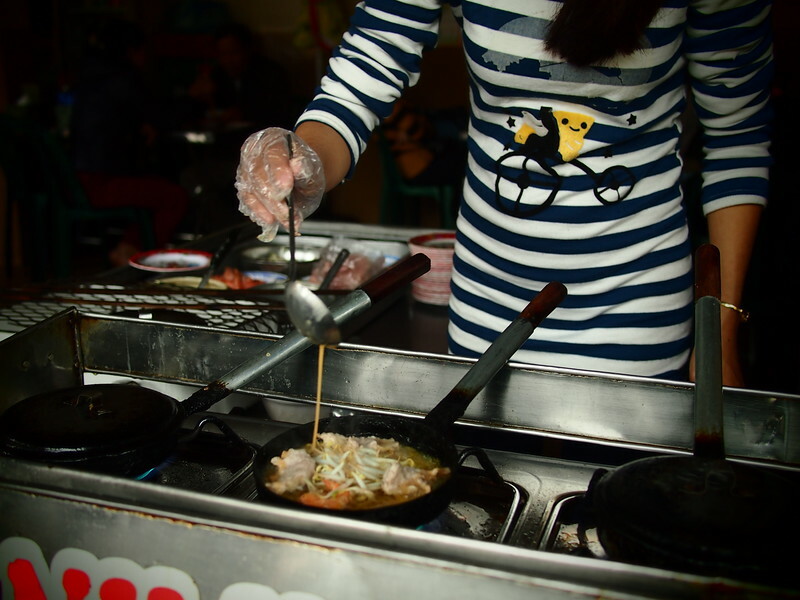 But eating at the source is always different, and the street snacks in one city vary wildly from the next. Besides, I had to add to my “doing x in x” list. 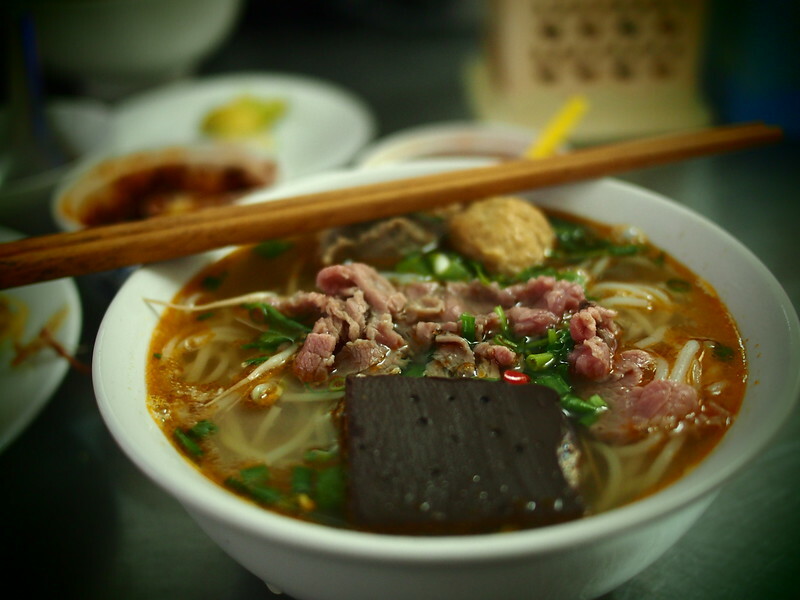 Eating bun bo Hue in Hue just could not be missed. In my excitement, I texted my friend Cam about food recommendations and ever the enabler of deliciousness, he sent back a PDF of a hand-drawn map and list of where he ate. I expected a weekend of sampling dishes and market exploration. I did not expect to feel like I had stepped into a strange other world of heavy memories that weren’t my own, and nights of disjointed sleep. I wanted to write a guide to the food but despite eating well the food remains an afterthought to my time in Hue. It is entirely out of character for me, but I felt a strange weight of the city’s history during my entire visit, one that gave me pause in terms of how to write this piece. Every morning there I woke up gasping for breath, still strangled by the last terrifying hold of a horrific nightmare. I dreamed of family members committing suicide, of war, of drowning, of running through forests that never ended. I would drag myself out of the curled edges of sleep only to find the remnants of those nightmares sitting with me all day, resting heavily on my shoulders as I roamed in search of food. When I would forget about them, a small corner or the branch of a certain tree would bring with it a claustrophobic flashback. I would be fine, and then the blood would drain from my face, as if my dreams were chasing me during the daytime. It seems unreasonable to say that I felt haunted the entire time that I was there, but I would be lying if I said otherwise. The hair on my arms stood on end during my entire time in the old city, spooking me. I do not normally have crazy nightmares, nor do I generally have problems with historical angry ghosts. But my weekend in Hue was a surreal mixture of fullness in my belly and complete confusion about the angst that I have only now been able to shake. Something indescribable affected me deeply, despite having visited unfortunate places that have suffered far worse fates than Hue. I arrived to the city quite late from Saigon, and woke up the next morning to a torrential downpour. “Sad weather,” the hotel manager said, peering outside at the sheets of rain. Then, brightly, “but you can still eat!” The night before, as I sat shivering in the lobby waiting to finish checking in, I was asked what tombs I wanted to see, and what plans I had in mind for the coming visit. My answer — that my goal was merely to wander and try Hue’s specialities, hopefully getting a feel for the city — was not what the hotel expected. “You mean, you just plan to eat?” they asked incredulously. Confusion turned to enthusiasm fairly quickly that morning, and by the time the rain had let up slightly I was armed with a list of places to try and some advice about what to look forward to. My first order of business was Dong Ba market, a way of getting to know more about what was sold on the ground and what food was available for those doing their morning errands. The market was a maze of stalls and colours, spilling out of the dimly lit concrete building that housed its core and onto the surrounding streets and alleyways. Along the water’s edge, a woman sold live chickens and bananas, and as I approached she tried to unceremoniously stuff one of the squawking birds under a wire mesh cone. 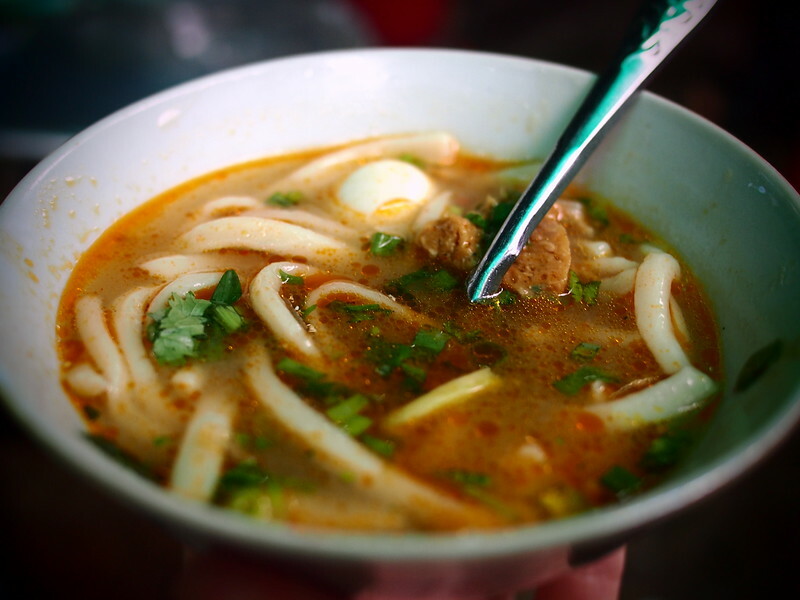 I saw that she was also in the middle of breakfast and as I tiptoed up so as not to spook the chicken, I figured out what my first meal would be: banh canh, a crab and tapioca noodle soup that I ate often in Saigon. Chilli, lime, garlic, and shallots. Can’t go wrong. My days in Hue followed a pattern: morning market, snack, lunch rush, snack, early dinner, nightmares. 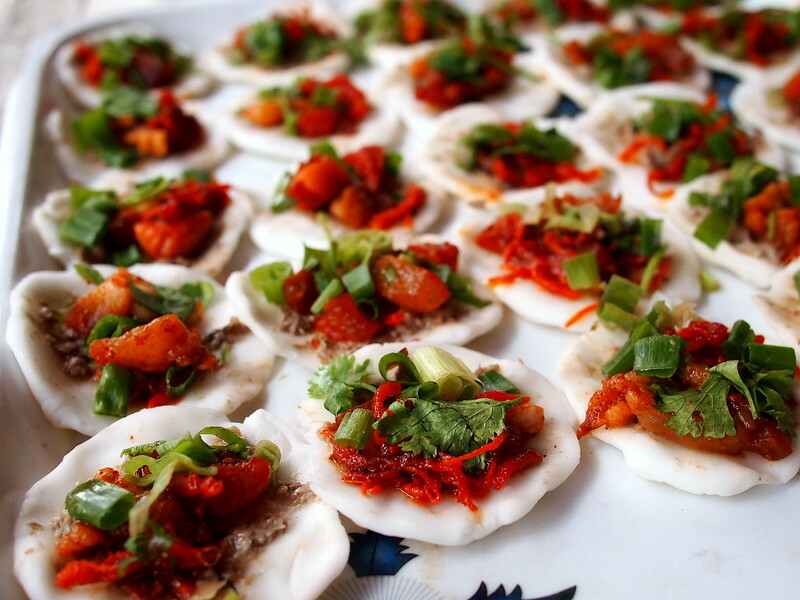 My focus was on the smaller snacks like banh ep that I wouldn’t find in Hue restaurants around Saigon. On the third day, I took a motorbike deep into the old city, getting completely lost in the narrowing roads. Past the dark Citadel, flag flying red against the cloudy sky, past the food recommendations I received from friends and the hotel, past anything that looked familiar. The looks on the faces of those coming in the other direction went from curiosity, to confusion, to unfriendliness the deeper I explored. Curving around a reservoir and stopping the bike to see where I was on a map, people glared at me as they drove by. While locals have been extremely friendly during my travels in Vietnam, I was clearly infringing on a part of the city most foreigners did not go, and I did not feel welcome. I doubled back and returned toward the Citadel itself, settling in at a bun hen (rice vermicelli noodles with baby clams) stall to shake off the remnants of the ride. The ruins of buildings around the stall were wrapped in a carpet of moss and mold, yellow walls straddled by the roots of gnarled trees, taking back what was once theirs. I ate my bun hen slowly as the rain began to fall. 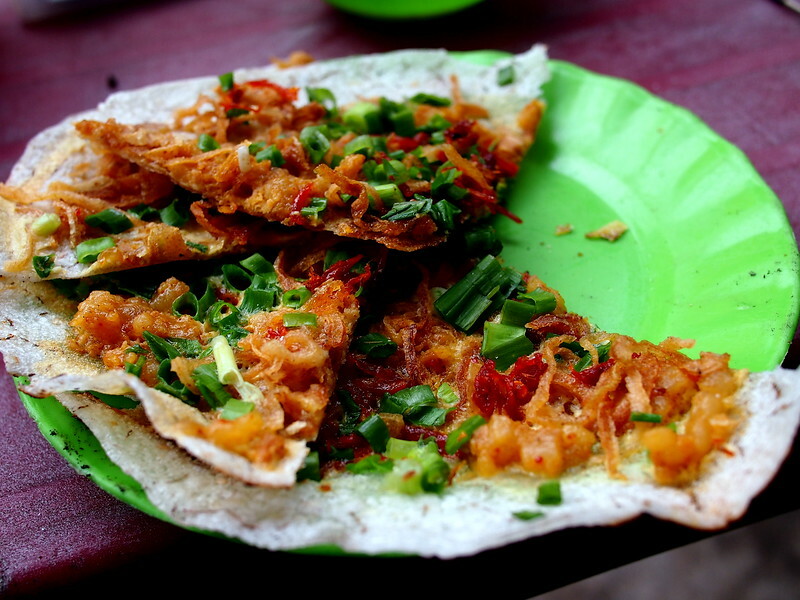 On my last day in town, the only item I had yet to find was banh tranh trung, a rice cracker ‘pizza’ that was a popular street snack. 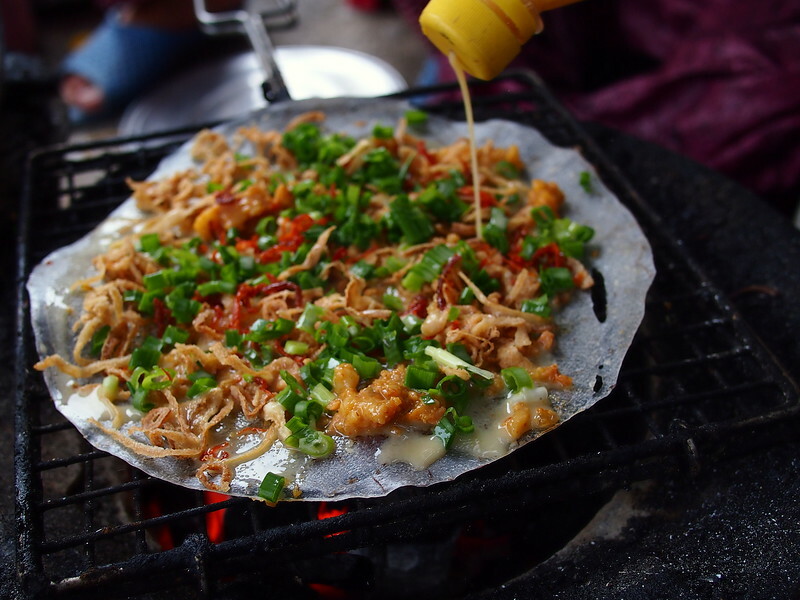 Much like banh trang nuong, a grilled rice paper snack that I wrote about in my early introduction to Saigon, this iteration involved a sheet of rice paper, ground pork, and fried shallots. The difference was in the egg — a full chicken egg in Hue, and a small quail egg in Saigon — and several of the toppings that went with it. As the minutes ticked down, I walked the grid next to the Citadel, peering down side streets in search of my that final bite of food. Finally, as I was about to call it a day, I spotted a small sign at the side of a dead-end street. Next to the sign, a tiny cart full of eggs, bananas, rice crackers, and more, with two giggling schoolgirls perched on tiny chairs surveying the scene. Banh trang trung in Hue. The yellow liquid is actually egg cracked into an old water bottle that has a hole punched into the lid. 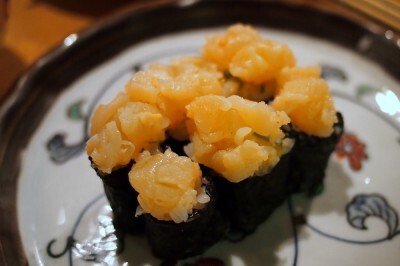 It was exactly as crunchy and savoury as it ought to have been, so much so that I lost track of time. I looked down at my phone midway through and jumped up. My flight back to Saigon was in less than two hours, and here I was in the damp streets of old Hue, dreamily munching on a rice cracker. I hurriedly pressed 10,000 dong in the vendor’s hand and rushed off, cutting diagonally toward the Citadel to make it back to the bridge. Scurrying across to the South Bank, I felt the mist clear both in front of me and in my mind. It felt almost immediately like the weekend had been some sort of dream, my nocturnal discomfort blending into the history of the place. As soon as I got back to Saigon, the nightmares stopped. 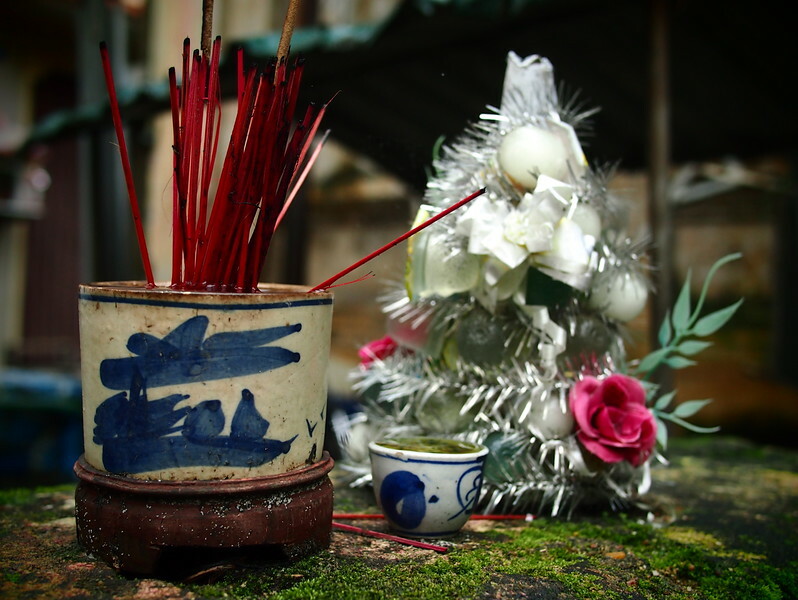 Days later and troubled by the feelings I had in Hue, I confided in a Vietnamese friend. This seemed like the wrong answer. “What are you trying to figure out?” she asked me as I tried to find other reasons. I was tired. I was hungry. I was affected by the rain. Shaking her head she mocked me gently. I suppose my North American brain is simply at a loss. This is a culture with a ghost month in lunar July — see this piece about the curse of the wandering ghosts — and my attempts for perfectly rational explanations seemed like a waste of energy to my friend. I am glad that the nightmares stopped, and that despite them I ate plentifully in Hue. Perhaps this is one of those things, much like my experience during the year of the Snake’s inauspicious beginning, that I can chalk up to spending a lot of concentrated time in a country place I love. For those heading to Hue, I seem to be the only one of my non-Vietnamese friends to have felt tortured there. For those travelling soon, may your days be filled with food and exploration and may your nights be calm. These places are not a representation of the full variety of Hue eats, but were ones that I enjoyed and were found on my motorbike and food wanders in town. The banh khaoi places recommended by many people was made with wheat flour, so I recommend the same restaurant as the nem lui for the gluten-free version of it, made with rice flour only. It’s less crunchy as a result, but it didn’t get me sick. And if you’re also heading to Da Nang, as many do when they’re in the region: James from Nomadic Notes has a roundup of the best cafes in town. You captured the heaviness of a place weighted down by its past beautifully. Although I’ve never been to Hue, I can relate to this feeling in other places that I’ve visited. Brilliant. As a verb, to pore is used with through or over and means that you are absorbed in the study of something or that you are reading something intensely. and “took the reigns” — although “reign” may have been what the king did after he took power, I think it is “took the reins” figuratively, like the reins of a horse, to guide things. Interesting post … Glad you are writing some new ones … I miss them when it has been a while. Hi Carolyn, you’re not the first to point out the typo, but I haven’t been online to fix it. It’s funny, I used to have a reader who would sign his emails Mr. Typo, but sadly I haven’t heard from him in awhile. I’m well aware of the difference but unfortunately missed the mistake on my read-through before hitting publish. Thanks for the comment! I’m actually heading back to Vietnam tonight from northern Laos, spending a few weeks in Hanoi, but will be going down to Hue afterwards. Look forward to trying some of these places out. 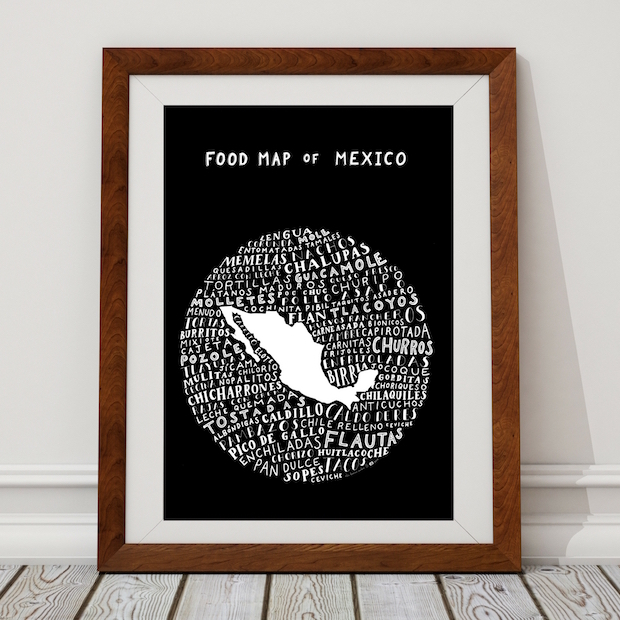 I’m always looking for good recommendations for food as I travel. I quit my job about a year ago to travel, eat and write! Hey Jodi, beautifully written and I can feel your connection to the place in your words. After spending 2 weeks in Phnom Penh I had very similar feelings, the longer I stayed the deeper I started to explore and see the effects of its history, and I still think about it today many months later. I’m off to check Bourdain’s Hue episode now! I definitely had the type of sensations Jodi describes in Hue in Cambodia but think it is almost to be expected there. Never heard like that for Hue – very mysterious and fascinating at the same time! 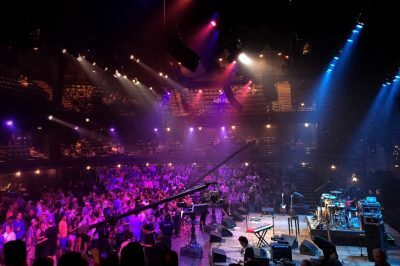 You really got to enjoy the place by interacting with the people. I love how you relayed your story in a way that let people relate with everything you have experienced. 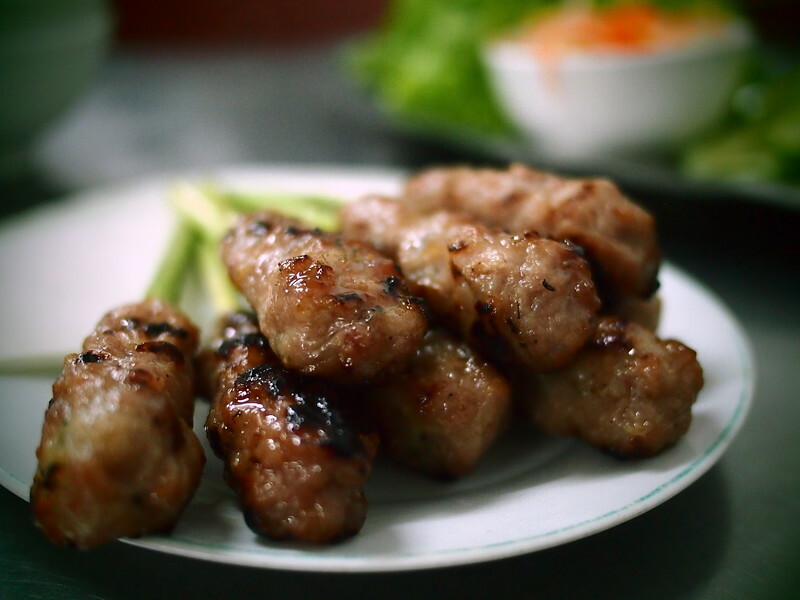 The best place to eat Hue foods is at home. Luckily my wife is from Hue. 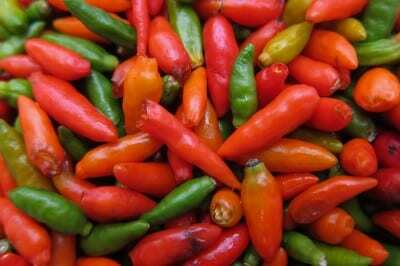 Mention is made of Com Hen/Bun Hue.-rice or noodles with small mussel like shellfish from the Perfume River. One of the two islands in the river has many cheap restaurants serving up this Hue classic dish. I went out to one of the islands in Hue in 2014 and had some awesome com hen. I continually try to recreate that flavor today. One of my favorite places on earth. Hi Jodi! What an awesome story! My daughter, her friend and I spent a couple of nights in Hue this past December and I can totally relate to your perceptions of the city. But it is suc a cool and awesome place. We plan on returning soon now that Theresa has returned to Saigon. I love your writing! 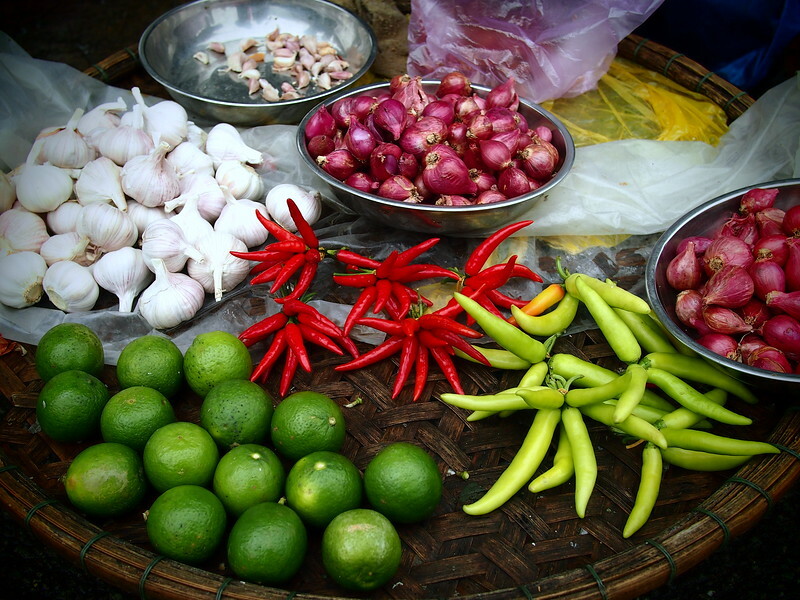 I’m travelling in Hue and just came across your blog in a google search – it’s amazing! We ate our way through the city following your suggestions, all of which were delicious and spot-on. We particularly liked Hanh, the food was so good and the owner was so friendly. The context you include is great as well, thank you so much. I’ll be sure to check your site for the cities we are going to next. Hi Jackie! Thank you for the kind words. I hope you have continued great travels, and thank you for reading. 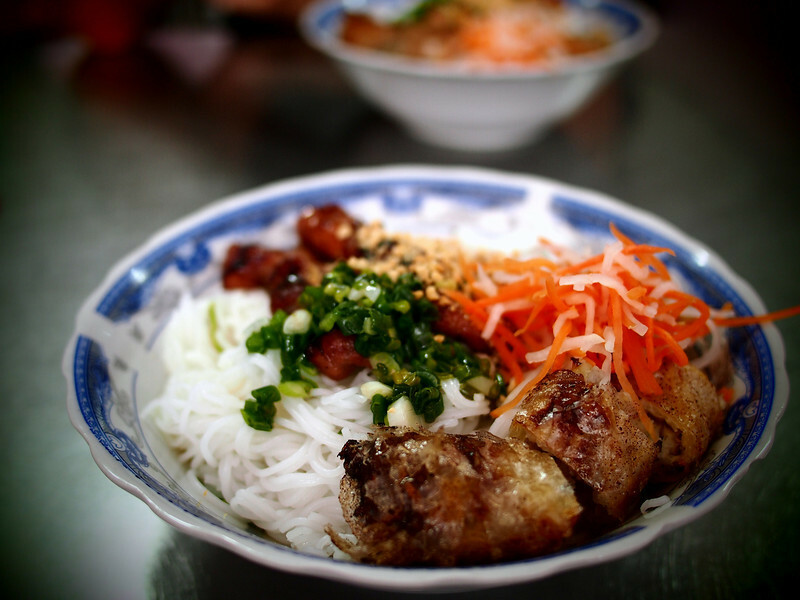 I’m food obsessive and currently am in Vietnam so this blog is incredibly handy thank you. Its also one of the best written, with a distinct voice and style and genuine insights without trying too hard. Furthermore (I declare pompously as if my opinion matters) it is delightfully unpretentious on the food front but clearly passionate and knowledgeable… I salute you! Oh wow! Great post, I’m so hungry now. I was in Vietnam last April but unfortunately didn’t make it to Hue but definitely had it on the list for my next visit, your post has just cemented it’s place as the number one stop. Thank you! Hi Jodi, The disturbing experiences you had may have been made more intense by the fact that you were eating pork. As pigs are de-evolving animals and often treated very badly, the meat has a lot of astral larvae which you may not notice until you see them in your dreams. Also, over-eating activates the inferior chakras in the abdomen and when the subconscious takes over in our sleep, all the horrors of our own abyss become visible to us. Some of the things you saw in dreams are not external beings but actually your own past lives and your own demons/egos but because of the stories you heard and environment your were in they manifested in the forms associated with that theme. That being said, some of them may have actually been external negative entities, but that is rare. Jodi, we just had the Bun Bo Hue at 38 Tran Cao Van. Our best bowl of the 4 we tried over the last two days. Thanks for the post! Thanks for writing this. It was a nice read as I prepare for my trip to Hue. 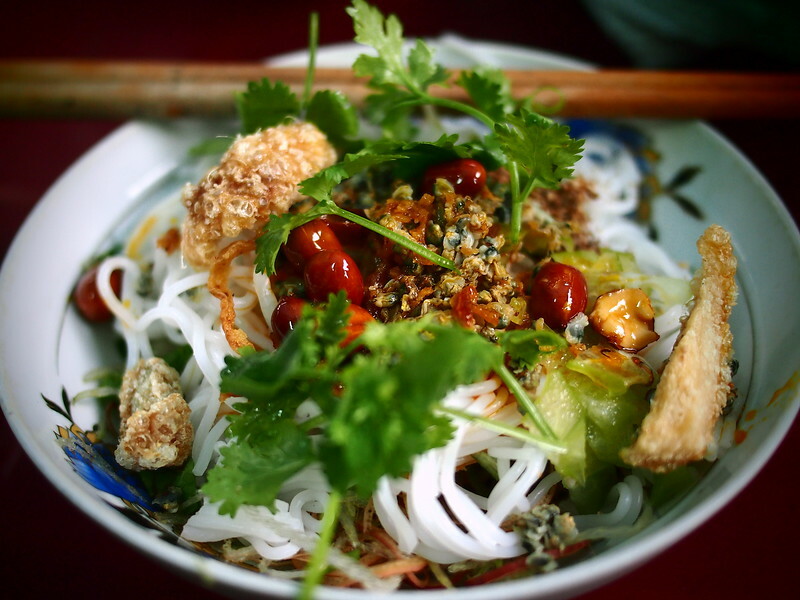 Vietnam is a gastronomical paradise. It is interesting to read how you were impacted by the spirits of the place. I find that some people are more perceptive than others at picking up such energy. I am currently living in Seoul on the military base and found immediately that there was a strange energy here. I kept saying there were unsettled spirits having no idea of the history of the place. Then I learned of the atrocities by the Japanese and that it used to be a Japanese prison. I guess such perception might be considered a curse by some but I find that it may help to better appreciate a history of a place when there is an actual emotional response to the energy of a place. I am kind of used to the ghosts after some time. Now I am ready to look at some more of your posts. Well done. Hi, great blog and photo’s! Sadly enough the weather in Hue if often terrible! The food although is fantastic! Hi Jodi, I’m coming across this post a bit–ok, very–late; I wish I’d known you were coming to Hue at the time. I’d have been pleased to bring you to more places, and to show you how to brave those stare-downs in the farther-from-city-centre areas (with the right words, those annoyed faces bloom smiles). I’m happy to see that you enjoyed some of my favourite Hue dishes at fave places (Hanh is one of them). Sorry to hear that the local history overshadowed your visit so heavily, but glad your food encounters were all that you’d hoped for. Thank you Chris! It would have been great to meet you on this short trip. No need to apologize – I think the local history is very important to remember. I hope you are well! Beautifully written, Jodi! I came for food tips, but got a great read. So harrowing. Love your writing style! Thank you Linda! 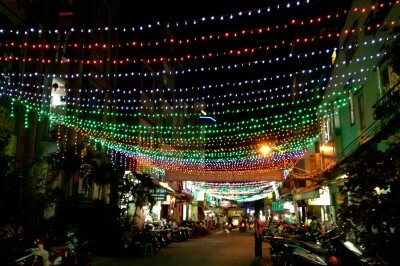 Hope you enjoy Hue and all its beautiful food.